Posted in: Christian, Christianity, Religion, Spirituality, Uncategorized. Tagged: Christianity, Jesus, Prophecy, Prophet, Religion. The Lord thy God will raise up unto thee a Prophet from the midst of thee, of thy brethren, like unto me; unto him ye shall hearken. Deuteronomy 18:15. The hope of Israel was embodied in the promise made at the time of the call of Abraham, and afterward repeated again and again to his posterity, “In thee shall all families of the earth be blessed” (Genesis 12:3). As the purpose of God for the redemption of the race was unfolded to Abraham, the Sun of Righteousness shone upon his heart, and his darkness was scattered. And when, at last, the Saviour Himself walked and talked among the sons of men, He bore witness to the Jews of the patriarch’s bright hope of deliverance through the coming of a Redeemer. “Your father Abraham rejoiced to see my day,” Christ declared; “and he saw it, and was glad” (John 8:56). The same blessed hope was foreshadowed in the benediction pronounced by the dying patriarch Jacob upon his son Judah. Through Moses, God’s purpose to send His Son as the Redeemer of the fallen race was kept before Israel. On one occasion, shortly before his death, Moses declared, “The Lord thy God will raise up unto thee a Prophet from the midst of thee, of thy brethren, like unto me; unto him ye shall hearken.” Plainly had Moses been instructed for Israel concerning the work of the Messiah to come. “I will raise them up a Prophet from among their brethren, like unto thee,” was the word of Jehovah to His servant; “and will put my words in his mouth; and he shall speak unto them all that I shall command him” (Deuteronomy 18:15, 18). About 40 days after the birth of Christ, Joseph and Mary took Him to Jerusalem, to present Him to the Lord, and to offer sacrifice. The priest went through the ceremony of his official work. He took the child in his arms, and held it up before the altar. After handing it back to its mother, he inscribed the name “Jesus” on the roll of the firstborn. Little did he think, as the babe lay in his arms, that it was the Majesty of heaven, the King of glory. The priest did not think that this babe was the One of whom Moses had written, “A Prophet shall the Lord your God raise up unto you of your brethren, like unto me; him shall ye hear in all things whatsoever he shall say unto you” (Acts 3:22). He did not think that this babe was He whose glory Moses had asked to see. But One greater than Moses lay in the priest’s arms; and when he enrolled the child’s name, he was enrolling the name of One who was the foundation of the whole Jewish way of worship. Posted in: Religion. Tagged: God, Jesus, Prophecy, Revelation. Locusts streaming from a bottomless pit. An eagle that shouts, horses by the hundreds of million and a burning mountain that plunges boiling and hissing into the sea. We arrive now at the seven trumpets. But not at the seven trumpets alone – for first of all, as we have come to expect, we’re going to find an introductory scene located in the heavenly sanctuary. Between the sixth and seventh trumpets we’ll also find scenes of end-time assignment and assurances. We found a similar arrangement of sanctuary scenes and end-time scenes when we studied the seven seals. The seven trumpets and the seven seals. We can, in fact, make several comparisons between them, in addition to this matter of their sanctuary and end-time scenes. For example, both trumpets and seals are arranged in groups of four and three. The first four seals form a group, the four horsemen of the Apocalypse. The last three trumpets likewise form a group of three fearful woes. See chapters 8:13 – 9:21; Revelation 11:4-18. Additionally, four angels hold four winds between the sixth and seventh seals; and four angels are seen bound near the River Euphrates under the sixth trumpet. See chapters 7:1-3; 9:14, 15. There are interesting contrasts too. The four angels who hold the four winds in the seven seals are told to keep on holding them in order to delay judgment; see Revelation 7:3. But four bound angels in the sixth trumpet are released in order to inflict judgment in chapter 9:14, 15. In chapter 8 verse 1, there is silence in heaven under the seventh seals. Yet, in chapter 11 verse 15 under the seventh trumpet, Christ’s coronation is acclaimed by loud voices. There are also many interesting comparisons to be made between the seven trumpets and the seven last plagues, so many, in fact, that some readers have suggested that the trumpets are the same as the plagues. The difference between the trumpets and the plagues, however, leads us to call the seven trumpets warning judgments (again, how?). People who learn the lessons that the trumpets are designed to teach won’t have to suffer the catastrophic judgments of the seven last plagues. The trumpet judgments are initiated by an act of one of the angels who ministers in the heavenly sanctuary. We would call the heavenly Sanctuary “a friendly place” and it is a loving, friendly place. But we call it “Cosmic Control, because the sanctuary is the place where God on His throne conducts the affairs of the entire universe. Matthew 10:29, and 30 gives us the assurance that while God is conducting the affairs of the entire universe, God observes each sparrow that falls. He knows the number of hairs on our heads. Hebrews 1:14 shows us that even the angels take a keen personal interest in us, being sent forth to serve God’s children everywhere. In Daniel 4:13-18 we read about an angel watcher who demanded the humiliation of King Nebuchadnezzar when his pride and ambition made him excessively oppressive to his subjects. God’s rich personal interest in us as our heavenly Father makes Him deeply concerned when we as brothers and sisters in His very large family, don’t treat each other as we should. There are truly impressive grandeurs about the scope of the seven trumpets. Like the seven letters and the seven seals, the seven trumpets are located in the historic half of the Revelation chiasm. Like those others, the trumpets deal with the sweep of Christian history. But whereas the seven letters deal almost exclusively with the Christian church and the seven seals deal mainly with western Christianized civilization, the seven trumpets are concerned with all three of the great world religions that worship the God of the bible. The trumpets reveal god’s concern for Judaism and Islam, as well as for Christianity; and in dealing with Christianity, they focus in turn, on the great Eastern Orthodox Church as well as on the Western Church. The seventh trumpet involves all mankind and surveying the trumpets is a breathtaking experience. So let’s begin our study of the seven trumpets which is broken into two chapters. The warnings of the seven trumpets are so severe and graphic that they seem to jump out of the one who reads Revelation, chapters 8 and 9. God is concerned for the eternal well-being of His children on earth. Judgment is coming! As the warning trumpets blast their alarm, are His children on earth sleeping? Apparently! Are they aware of their danger? Apparently not! We will discover that six of the seven trumpet warnings are concerned with all three of the great religions: Judaism, Islam, and Christianity, as well as the Eastern Orthodox Church and later on, the Roman church. The seven trumpets involve all mankind and demonstrate how the entire world has moved and is moving toward judgment. Let’s find out about these seven earth-shaking trumpets. NOTE: It may be a little difficult for us to realize the importance of sounding of the trumpets in Bible times. In an age when news reporters tell us of any events of worldwide interest within twenty minutes of its occurrence all around the globe, we may find it difficult to begin to understand the very limited scope of communication during Bible times. Without TV, radio, telephones, newspapers, telegrams, etc., the trumpet’s blast held great significance: the call to arms, the warning of disasters, a call for repentance, and a solemn assembly. In most cases in the Old Testament, trumpets were used in the context of the temple liturgy and holy wars. Used in religious ritual service, and for a call to prayer and over burnt offerings as a reminder to the people that the Lord is your God. The concept of “remembering” before God is crucial for an understanding of the theological meaning of the seven trumpets in Revelation chapters 8 and 9. Trumpet blasts in the Old Testament also designated the appearance of God in relation to the most important events in Israel’s history. In the giving of the law at Sinai, the Israelites experienced thunder and lighting, a thick cloud on the mountain and “a very loud trumpet sound” (Exodus 19:16; 20:18). At Jericho (Joshua 6:4-16) the trumpet sound played a part in the destruction of the city. The trumpets blew and the walls fell down. The trumpets were used to call upon God to perform his miraculous act. Finally, trumpet blowing will announce the approaching Day of the Lord (Christ’s Second Coming) Joel 2:1; Zephaniah 1:16. At that day, “the Lord God will blow the trumpet, and will march in the storm winds of the south” Zechariah 9:14. Under the fifth seal we saw in Revelation 6:10 the saints are heard symbolically crying asking “How long O Lord, holy and true, will you not judge and avenge our blood on those who dwell on the earth?” We will remember that their prayers are not prayers for revenge but a plea for justice and deliverance. Revelation 8:2-5 shows, that the prayers of the saints are heard by God. As we will see in our next two lessons that the seven trumpets are not natural calamities and disasters. Instead, they are manifestation of the presence and reality of Almighty God in history. The trumpets are God’s response to the injustice and harm being down to His people. But, we must caution that these are not general plagues that will be poured out upon all people, they are only directed upon people who have resisted the spread of the gospel. They do have a redemptive aspect in that they service as a warning to the wicked as to what is eventually coming. They also serve as a mile stone, or marker as to how close Christ’s coming is happening. There is still time for the wicked to repent. The question is, will they? NOTE: The message of the seven churches came from the candlesticks, or lampstands. The message of the seven seals pictures Christ standing before the throne of God, the message of the seven trumpets pictures an angel offering incense at the golden altar of incense. You will notice that the message of the seven trumpets of warning, like the churches and the seals, starts in the Holy Place of the sanctuary and ends in the Most Holy Place, with the judgment and the coming of Jesus. Just as Jesus started His ministry in the Holy Place in John’s day, so the churches, seals, and trumpets start there. Similarly, just as Jesus finishes His work in the Most Holy Place, so the churches, seals and trumpets finish thee with His coming. The angel with the censer is no doubt the same angel mentioned in Revelation 14:18. Jesus probably was the one who provided the incense. ADDITIONAL NOTE: The angel was given much incense, which was undoubtedly given to him by Jesus Christ, our High Priest. Priests offered sweet-smelling incense at the little golden altar in the Old Testament Sanctuary. Maybe in heaven Jesus has the angel also offer literal incense. In any case the incense is symbolic of Jesus Himself, representing His sweetness and kindness, and especially His sacrificial death on the cross. It stands for everything that constitutes His goodness-His Merits, to use a theological term that convinces the universe that it’s all right for God to answer our prayers. The incense, whatever it is, is not offered to persuade God to love us! God already loves us! See John 16:27. It is because God loves us that He sent Jesus to live and die for us. See John 3:16 and GC 1:117. The Bible doesn’t explain everything we’d like to have explained, but it does inform us that heaven is personally interested in our prayers. John saw an angel at heaven’s golden altar offering incense as we pray. Revelation 10:7 leads us to conclude that the seventh trumpet happens at the time of the second coming of Christ. Revelation 11:15 further confirms this to be when Christ will reign forever and ever. It is important to note that at this point in Revelation Christ is referred to the One “Who is and Who was because you have taken your great power and begun to reign” while earlier in the book he was referred to the “One who is and who was to and who is coming” (Revelation 1:8; Revelation 4:8). Now in Revelation 11;17 he is no longer the God “who is coming” because he has already come and set up His kingdom. These leads us to conclude that the blowing of the seventh trumpet bring us to the very end of earth’s history just like the seventh seal does. At the beginning of the Seven trumpets we are shown the Priest, which would be Christ being given much incense. In the ancient sacrificial system this would have been at the time of the evening sacrifice. A reminder that Christ died on the cross as our sacrifice at the time of the evening sacrifice. As we saw in our study of Revelation 4 and 5, the death of Christ as our substitute for sin was represented by the Altar of Sacrifice in the court yard of the earthly Sanctuary. After his death Christ was placed in a tomb, which is represented by the Lever that stood before the door of the Holy Place. The lever representing Christ burial in the tomb and our symbolic burial of sin at the time of our baptism. Then on the Day of Pentecost as the Holy Spirit was being poured out upon the disciples, Christ was being crowned as our King in the coronation ceremony which took place in the Holy Place in the heavenly sanctuary. Christ was not only received coronation as our king, but also as our high priest. Now standing at the right hand of God with censor of incense Christ stands before the Altar and issues the command for the trumpets to blow, just as it had in the ancient Israelite service at the time of the evening sacrifice. The seven trumpets begins with Christ in the Holy Place, and while these trumpet blasts are taking place upon earth, Christ moves from the Holy Place to the Most Holy Place to finish his service in the heavenly Sanctuary. One last note on the trumpet. 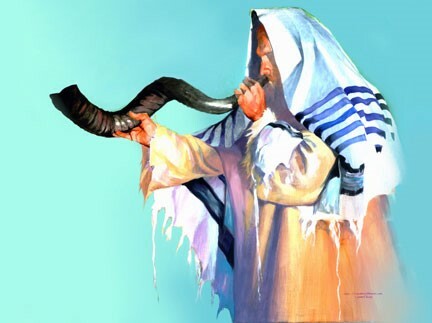 In ancient Israel the blowing of the seven trumpets signifies that the sacrifice has been made once for all. In the cross there is an offer of both grace and judgment. Grace for those who believe; these are saved and are already saved. But for those who reject and oppose the gospel, judgment has already begun. The trumpets are just another way of bringing this concept to view that runs through the entire book of Revelation. As we will see, it is reasonable that the seven seals and seven trumpets refer to the same period of history between the cross and the second coming. Answer: Noises Thunder, Lightening, Earth Quake, Hail and Fire Followed with Blood and 1/3 of threes were burned up and all the grass was burned up. NOTE: Usually “hail, fire, and blood” taken together characterize warfare. ADDITIONAL NOTE: Exodus 9:22-26; and Ezekiel 38:22-23: In these two passages we see that God uses the hail, pestilence and bloodshed along with fire to judge those who have been unfaithful to him. In the case of the Egyptians, they plagues that rain down upon them was to prove to the Egyptians and the Israelites that these foreign gods, gods made of wood, stone, and things of nature have no power to stand up against the God of heaven. In Ezekiel Gog is representative of Satan and Magog represents the kingdom of Satan. Ezekiel makes it clear that hail stones the weight of about a talent will add to the destruction which is also being caused by fire. Additional Note: Exodus is talking about the plagues that came upon Egypt. Plagues that were used not against the people, but against the gods of the people and to repair the Egyptians for their mistreatment of God’s people. So the question remains, who all do the plagues rain down upon? God’s people, the wicked, or can they rain down upon both? Additional Note: The answer is that the trumpet plagues can also fall upon God’s people. They fall upon God’s people that are not living up to their potential. Apostate Christians. ADDITIONAL NOTE: This begs the question: does God punish? Has his love we have seen thus far in Revelation been turned to Anger? Does God both love us and hurt us? Does our High Priest, who always lives to make intercession for us, (Hebrews 7:25), sometimes punish us? The New International Version renders that last verse, “Those whom I love I rebuke and discipline. So be earnest and repent.” Today’s English Version has “I rebuke and punish all whom I love. Be in earnest, then, and turn from your sins.” Sometimes love does have to shout-and punish. So the first trumpet blows out judgment against the Jews. I Peter 4:17 states: For time has come for judgment to begin at the house of God; and it if begins with us first, what will be the end of those who do not obey the gospel of God? We have seen from our study that the seven churches and the seven seals cover the span of Christian history and the first church and the first seal saw fulfillment during the first century – while John, who wrote Revelation, was still alive. So for the fulfillment of the first trumpet we look during the lifetime of the apostle John for an outstanding military disaster affecting people who claimed to believe in God. Why? How could this happen? The Jewish nation had persistently rejected God’s prophets, finally they had demanded the death of the Son of God, who had come to save us all. So God reluctantly left them to the result of their own choices. “Your house is left unto you desolate,” Jesus said tearfully in Matthew 23:38. Jerusalem fell to its enemies because it first fell away from God. Jesus foretold this day in two different Bible passages. Luke 13:6-9 where He pictured Heaven as patiently giving the gif tree yet another chance. Just before His crucifixion, Jesus finished the parable. Passing a fruitless fig tree growing beside the road, He stepped over to it and said. “May no fruit ever come from you again.” The tree at once withered away. The story is in Matthew 21:18, 19. Listen to these words of Peter in I Peter 4:18 and 19. Now “If the righteous one is scarcely saved, where will the ungodly and the sinner appear?” 19 Therefore let those who suffer according to the will of God “commit their souls to Him in doing good, as to a faithful creator. The decision that Jerusalem should be left to its fate fell like fire from heaven, but the fiery destruction was accomplished by the city’s pagan enemies, the Romans. However, if this was God’s judgment, his intention was to wake people up. Note the following: in the writing of many early Christian leaders, the fall of Jerusalem was cited as evidence that God’s true people needed to be more deeply spiritual than were the Jews who worshiped God but rejected his Son. Compare Ezekiel chapter 9 to I Peter 4:17. Ezekiel chapter 9 makes it clear that hail and fire symbolize divine judgments that would fall on the enemies of Israel. But Ezekiel also talks about sealing those that are faithful to God, so that they will be unharmed by the coming judgement. This is reminiscent of what we will see later in Revelation. But Ezekiel also makes it very clear that even if you are one of God’s people, but have not established a relationship with Christ that allows his character to be reproduced in your life, then you can miss out on this seal of God and suffer the same fate of the wicked. IMPORTANT NOTE: God’s judgement also begins with the house of God. God’s faithful followers. We will explore this more in the lessons to come. Finally the unthinkable happened. Alaric, once a Roman officer, led the Germanic peoples in the first successful invasion of the city of Rome. The symbols of ice and fire mingled with blood find meaning in this brutal invasion from the north, breaking the backbone of the Roman Empire. The eastern half of the roman Empire would survive to live another day. The West was domed to die. These next three trumpets are God’s judgments on pagan Rome. Since the time of John’s death, the tranquility and peace of the Roman Empire began to fall apart. Answer: Something like a great mountain burning with fire. A 1/3 of the sea became blood and 1/3 of the living creatures in the sea died and 1/3 of the ships were destroyed. ADDITIONAL NOTE: In Revelation 17:1 and 15 waters symbolize peoples and multitude and nations and tongues. Thus the sea of the second trumpet is a sea of humanity. The living creatures in the sea and their ships are people and their material possessions. The fiery mountain that plunges into the sea, destroying the sea dwellers and their ships, is an invading tribes on the rampage. Jeremiah 51:25 brings vividly before us the scene of a burning mountain. In this case God is saying that he is against the destroying mountain who destroys all on earth. At the time of the second trumpet, who is the only world power? Daniel saw a vision in Daniel chapter 2 in which there were four world powers. During Christ life time and the time of the early Christian church there is only one world power left for the other three had passed into the pages of history. You are correct, it is Rome. So it would appear that the first trumpet was against God’s people, the Jews, who had rejected the Gospel message and this second trumpet then against Rome who were the instrument used by the Jews to put Christ to death and then later persecuted the Christians. It is hard to imagine two groups that were more opposed to each other than the Jews and the Roman Empire, yet the two united to kill Christ and oppose the spread of Christianity. For this it appears our first two trumpet blasts or judgements are against these two groups, the Jews and the Roman Empire. NOTE: The second attack on the Roman Empire was by sea. The amphibious armies of the Vandals, under the leadership of Genseric, left destruction all the way from Gibraltar to the mouth of the Nile. His attacks were almost all from the sea. In one night he destroyed half of the ships belonging to Rome, destroying 1,113 ships and killing more than 100,000 men in the Battle of Carthage! So much havoc and devastation was caused by this man that until this day we refer to malicious damage as vandalism! ADDITIONAL NOTE: Revelation 1:16, 20; Job 38:7; Revelation 12:4, 7-9: All three of these verse talk about angels. In Revelation chapter 1 it is talking about the seven angels that are messengers to the seven churches. In Job 38:7 angels are referred to as stars. It is also interesting to note that text uses the language, “When the morning stars sang together, and all the sons of God shouted for joy? It is believed by some Bible scholars that the reference to the Morning Stars singing together is referring to a time when Lucifer and the Pre-Incarnate Christ sang together before the throne of God. In Revelation 12:4 we see this an angel being thrown out of heaven and it drew a third of the angels with it when it fell from heaven. So angels can represent God’s minister that are sent to the church to proclaim God’s end time messages to the church. But angels also represent both heavenly beings that have remained faithful to God the Father and Jesus and as we see in Revelation, angels can represent Satan and the fallen angels. Isaiah 14:12-15 mentions a star of the morning falling from heaven, which is a reference to Lucifer and his rebellion against God. NOTE: Angels are called “Stars.” Wormwood is a poisonous and bitter plant, a fitting symbol of the fallen angel Lucifer. When Attila the Hun struck Rome, it seemed like the Devil himself had fallen on the empire. None of the invasions were pleasant, but this third one was the ugliest of all. This third and most bitter attack came by way of the rivers where Atilla often made his headquarters. Called “The Scourge of God,” Atilla and his barbarians raped, murdered, and turned into smoldering ruins city after city without mercy or compassion. What Atilla did to Rome, the Devil is in the process of doing to this world. ADDITONAL NOTE: In Revelation 8:10 and 11 describe 1/3 of the waters becoming bitter. The name of the star is Wormwood and in verse 11 it states that 1/3 of the waters became wormwood and men died from the water because it was made bitter. Wow, what is happening here? Naturally occurring springs of water have always been precious as s sources of drinking water. Revelation 21:6 offers spiritually thirst people an opportunity to drink of the fountain of the water of life. In Isaiah 12:3, Proverbs 13:14 and John 7:37, salvation, true wisdom, and Christ Himself are likened to springs, wells, and water. In Jeremiah 2:13, God rebukes His people for forsaking Him, the fountain of living waters and hewing out for themselves broken cisterns that cannot hold water. David and Jeremiah both compares a man who has delighted in the Word of God with “a tree firmly planted by streams of water (Psalm 1:3; Jeremiah 17:7-8) In John 7:38-39 Jesus used the symbol of rivers and springs of water as a symbol of the spiritual nourishment of the Word of God which a person receives when the Holy Spirit comes into his or her life. It would appear to those looking at Christianity from afar that Satan instead of Christ is in control of the church. So it is clear that the period of the third trumpet is the time after the fall of the Roman Empire. All the Apostles warned that this would happen to the church and as we saw in our study of the seven churches we can see the teaching of Balaam and Jezebel creeping into the church. To quickly review; who fell to earth for exalting himself and telling lies? Satan; and now Satan promulgates his errors through human teachers. Fountains of waters in contrast to heavenly bodies of the next trumpet, are found on earth. We can conclude that the third trumpet foreshadowed a polluting of Christian truth in God’s church on earth taught by so called Christian teachers. Once again God left his people to the results of their own choices. Hosea 4:17 “Ephraim is joined to idols, let him alone.” Matthew 23:38 “Your house is left desolate.” The western medieval church succumbed to the seductions of Satan, the fallen Wormwood angel. Step by step conforming to the patterns of secular and pagan culture. God allowed it to do so. In the process, the church lost most of its power to transform people. Instead it often abetted them in their crimes. The sweet sparkling fountain of life became muddied and bitter. It became like wormwood. ADDITIONAL NOTE: John uses the term 1/3 over and over again. Why? It shows judgment is not complete. “God’s law and Christ’s priestly ministry in the heavenly sanctuary . . ., or continued intercession, were surely obscured by an all-too-earthly system of laws and priests and sacrifices.” God Cares, Vol. 2 p. 242. Additional Note: The scene described here is reminiscent of the ninth plague of Egypt which was darkness (see Exodus 10:21-23). In his prophecy against Egypt described in terms of the plague of darkness in Exodus (see Ezekiel 32:7-8). Darkening of celestial bodies in the Old Testament prophetic books is consistent symbol of the appearance of God in judgment (see Isaiah 13:10; Ezekiel 32:7-8; Joel 2:10; Joel 3:15). Light in the New Testament stand for the Gospel. Jesus himself is the ultimate source of spiritual life. He is the true light that enlightens everyone in the world (John 1:9). Jesus made it very clear that darkness is the consequence of ignoring or denying the gospel. It is in this sense that the symbolism of darkness of the fourth trumpet plague must be understood. The third trumpet is further developed in the fourth trumpet scene. While the third trumpet scene depicts in symbolic language the consequences of spiritual decline and apostasy of the medieval Christian church, the forth trumpet scene portrays the deepening of the prevailing darkness in the world in the period that followed the Dark Ages. After the first wave of reformers pointed the masses back to the Bible by emphasizing the simplicity and purity of the gospel, a new generation of Christians sprang up. These were so-called Protestants that subscribed Protestant Scholasticism which was characterized by theological polemics and controversies. During this period the Christian life became less about a personal relationship with Christ and more a matter of membership in the official church. Perhaps another and better way of understanding what is happening under the forth trumpet is the temporal darkening of the spiritual sources of true light, namely, the Bible gospel, under the prevailing influence of secularism. Secularism obliterates the gospel of Christ as the only source of spiritual life. But this is only partial darkness for only 1/3 of the world is in darkness. But the effects of this darkness become more evident as we hear the fifth and sixth trumpet blasts. Why does John use the term 1/3 when talking about the Sun, moon and stars? It shows judgement is not complete. God’s warning trumpets call us to become loving obedient Christians, letting His light shine through our lives to others. We cannot afford to sleep through the trumpets. □ I choose to follow the truth as it shines from Jesus. □ I want my life to shine brightly with the unselfish love of Jesus. □ I don’t want to be asleep during the final trumpet warnings. Supplemental Reading: God Cares vol. 2 pp, 228-243.